Shortly after the establishment of the Corps, M&D published a description of the uniform to be worn by its officers. This was published as General Order 62 of 1909. The uniform was to consist of a double-breasted jacket ‘of ordinary civilian length’, fastened in front by two rows of four buttons, of Canadian Militia pattern. The sleeves to be plain with two small buttons placed on the seam. Finally, the jacket was to include cloth shoulder straps of blue cloth with gilt rank badges. The trousers were to be of the same colour and cloth and no stripes were authorized. CSCI officers were to wear the blue Field Service cap, of Infantry pattern. The cost of providing the uniform was to be borne by the officer and was not provided at public expense. Shortly thereafter, in August 1910, the infantry pattern forage cap was permitted as a replacement for the Field Service cap. Militia & Defence drawing of the “King’s Cadet” badge. An example of the “King’s Cadet” badge, shown here in gilt. Image courtesy Peter Brydon. Missing from the uniform was a distinctive cap badge to be worn on the Field Service or forage cap. This was finally addressed in August 1911, when the ‘King’s Badge’ was authorized for wear by Cadets. It appears that the Canadian High Commissioner to London was partly responsible for this. This person was none other than Lord Strathcona, whose interest in, and financial support of, the cadet movement in Canada was considerable. The Strathcona medal continues to be awarded to cadets to this day. This ‘King’s Badge’ was the Royal Crest, i.e., a Crown surmounted by a lion rampant, below which was a simple scroll with the word ‘Cadets’. The Adjutant-General suggested in a letter that the King had approved the badge for use by cadets throughout the Empire. When shown to the Minister of Militia, Colonel Sam Hughes, he suggested that the badge include maple leaves in the design. These were sketched in, as well as an expanded scroll that now read “Cadets – Canada”, and the badge returned for the Minister’s approval. This unequivocally sets the date for this badge as early 1913 and that its use was for cadets and not instructors. Shortly after approval of the cap badge the Minister approved the use of a “Collar, Maple Leaf” (termed today as a General Service badge) and a ‘Canada’ shoulder title. The first drawing of the “Canadianization” of the British badge. A request for pricing was distributed and J.R. Gaunt was selected as the manufacturer. Unlike most badges produced on behalf of M&D, these were to be made available upon repayment (at 5 cents per badge). This approach was taken as it was felt that the ‘boys’ would keep or sell their badges rather than return them into Stores. This would result in additional work for M&D and the argument was made that the cadets would be pleased to pay the nickel. A rush order, for 1,000 badges, was placed so that delivery could be made prior to a cadet visit to England, scheduled for April of that year. Ultimately, a contract for 20,000 badges was issued. While the design of the cadet badge was under discussion, a suggestion for a variation of the badge, to be worn by CSCI officers was proposed. This badge, in two styles, differed in that the scroll included the word “Instructor”. However, the badge was not approved and CSCI officers were left to wear the approved cadet badge. Proposals for a specific badge for CSCI Officers. M&D did not approve either design. While this variant was not accepted by M&D headquarters, the CSCI officers in British Columbia adopted a badge of their own. This badge featured ornate scroll-work of the initials, within a wreath and surmounted by a Crown. This badge was approved in July 1914, (although the outbreak of war may have caused the paperwork to disappear), and continued in wear until the disbandment of the CSCI in 1921 – the result of a re-organization of M&D. The badge designed by CSCI officers in British Columbia and approved in July 1914. 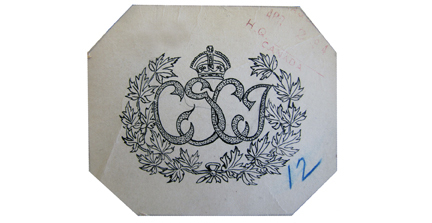 With the authorization, in 1924, of a new cadet organization, the Cadet Services of Canada, the District Cadet Officer for Military District 11 (British Columbia) asked HQ if the CSCI badge could be modified to read ‘CSC’ (Cadet Services of Canada) over ‘NP’ (Non Permanent) and used by the recently approved organization. Enquiries were made of J.R. Gaunt, which held the dies, and they replied that a change could be made. According to Gaunt, the earlier CSCI badge was “richly gilt, and burnished’. The modified badge was not approved and General Order 57 of 1925 re-affirmed that the authorized cap badge for CSofC officers was the badge authorized for cadets, i.e., the “King’s Cadet” badge with ‘Cadets – Canada’ in the scroll-work. The collar badges remained the Maple Leaf badge. Badges were to be bronze for wear on the khaki uniform and gilt for blue and scarlet uniforms. This GO also authorized the wear of the Infantry pattern uniform for CSofC officers. In 1943, GO 28 authorized a separate badge for cadets, leaving CSofC officers the sole group to wear the “King’s Cadet” badge. This badge remained unchanged until June, 1953, when the Director of Administration DOA), Department of National Defence (DND) suggested to the Director of Militia and Cadets (DMC) that GO57/1925 was obsolete. DOA proposed that a new badge, featuring the entire title of the Corps (Cadet Services of Canada, and that the Tudor Crown be replaced with the St. Edward’s Crown in accordance with Canadian Army Order 64-5. Further, as collar badges were usually a miniature of the cap badge, that the Maple Leaf collars be replaced. Finally, it was recommended that cap and collar badges be gilt while the shoulder titles be brass. The approved M&D drawing of the Canadian ‘King’s Cadet” badge. It was Sam Hughes who insisted on the addition of the maple leaves. It would be March, 1955, before DMC replied, agreeing with the changes to the cap badge but suggesting that the collar badges be modified as; reduced by one-third in size (from 1-1/8-inch high and 1-inch wide, to 3/4-inch high and 13/16-inch wide), and that the shape of the Maple Leaf be changed to comply with the style approved by CAO 64-2. All other recommendations made by DOA were accepted. On 16 April, 1956, the drawings of the badges were approved. The 1956 badge showing the ST. Edwards Crown and the modern (in 1956) Maple Leaf collar badges. These would remain the authorized badges for the Cadet Services of Canada until the creation of the Cadet Instructor List, later re-organized as the Cadet Instructor Cadre, and the introduction of new badges.